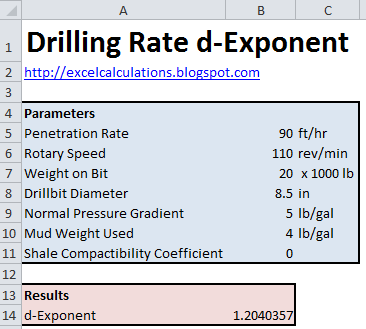 This Excel spreadsheet calculates the d-exponent, a parameter used by drilling engineers to investigate ppore pressure trends when drilling into over-pressurized zones. Normally, formation density increases with the drilling depth. But if the formation contains sand below the surface, then the drilling rate may increases with drilling depth. The d-exponent is used in several calculations to investigate these effects. N is the rotary speed.